The Theatre for Young Audiences (TYA) module exists to support you in the exploration of this vibrant and growing area of study. Recognizing that the arts are a vital component of the education of every young person, the TYA module allows you to heighten the synergy between active student groups (e.g. Purple Crayon Players, Griffin’s Tale), the nationally-renowned drama education community in Evanston (School District 65), the professional TYA companies in Chicago (e.g. Chicago Children’s Theatre, Adventure Stage Chicago, Child’s Play, Barrel of Monkeys, etc. ), the production work in the Theatre and Interpretation Center (including our Imagine U programs), the rich archival resources in NU’s library, and the dynamic coursework offered through the School of Communication. Currently, NU graduates are working in the field as artistic directors, performers, writers, teaching artists, education directors, arts advocates, and drama specialists; in addition they are placed in the field’s top graduate programs in the country—including Harvard, New York University, the University of Texas at Austin, and Arizona State University. 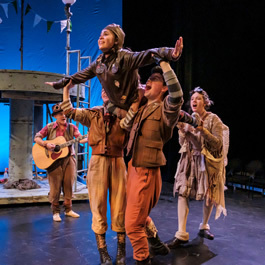 This module provides a concentrated study for a cohort of supportive learners with shared enthusiasm for theatre and young people; it culminates in a capstone designed to support you as you crystallize your learning and present yourself to the field.